Remarkably little of the work of the celebrated architect and collector Sir John Soane remains intact. The memorial he built for friend and patron Samuel Bosanquet in the churchyard of St Mary the Virgin in Leyton survived 150 years, far longer than much of his work. In my 1965 copy of “The Buildings of Essex”, Nikolas Pevsner, who describes the memorial as being “of typically Soanian Neo-Greek detail”, seems apparently unaware that it had been demolished 8 years previously. Ptolemy Dean in Sir John Soane in London rates the lost memorial as better than the De Loutherbourg monument in St Nicholas’ Chiswick and ‘second only to Soane’s own tomb’ in St Pancras Gardens. 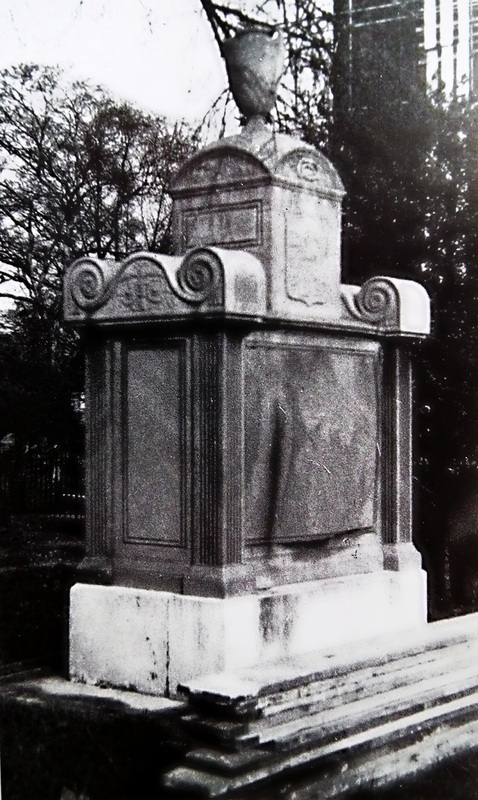 He describes the fate of the monument as ‘one of the saddest of any of Soane’s works’ and notes that the ‘minutes of the Churchyard Committee, although incomplete, record the renovation and levelling of a number of the tombs during 1957… A photograph of the Bosanquet tomb is annotated “tomb demolished 1957-1958 as a result of damage by Hooligans.” The work was carried out by the local firm T.R. Hurry & Sons. Soane’s Portland stone base survives, along with the original stone railing plinth. Above this a new granite slab was cut with the original inscription wording by Messers Hurry. 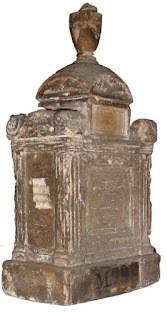 The fate of Soane’s substantial displaced stone copings and scroll stones remains unknown.’ A grainy monochrome photograph taken in 1953 by Dorothy Stroud, one time assistant curator of the John Soane Museum, and a clay model of the memorial by Soane is all that is left of the once impressive tomb. Samuel Bosanquet (1744-1806) lived in Forest House in Leyton and came from a Huguenot family with strong trading links to the Middle East. He was Deputy Governor of the Levant Company and was also a Director of the Bank of England and eventually its Governor during the period 1791-1793. Sir John Soane had first become acquainted with a Bosanquet in Naples during his 1778-1780 Grand Tour of Europe. 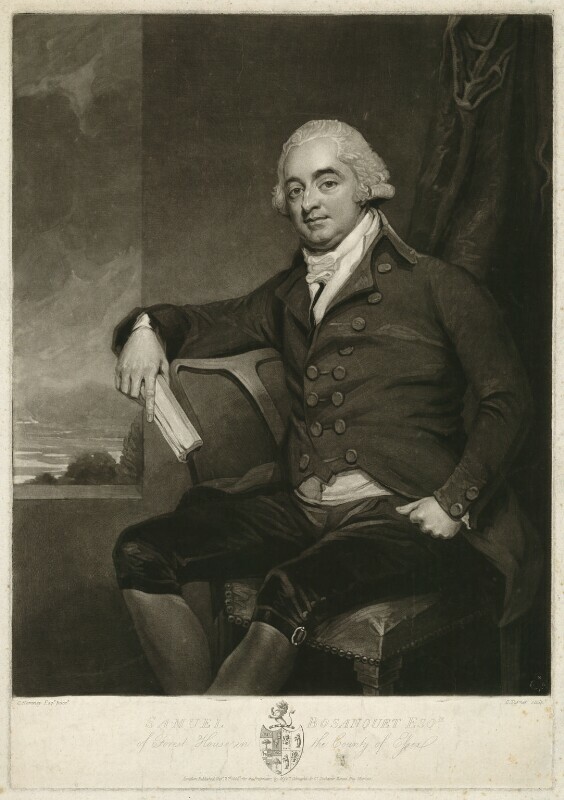 There he stayed with Richard ‘the rake’ Bosanquet, a first cousin of Samuels, who had been a Director of the East India Compnay before giving it up to lead a life of leisure and pleasure in Southern Europe. Richard eventually squandered his fortune in luxurious living and rash speculation in stocks. 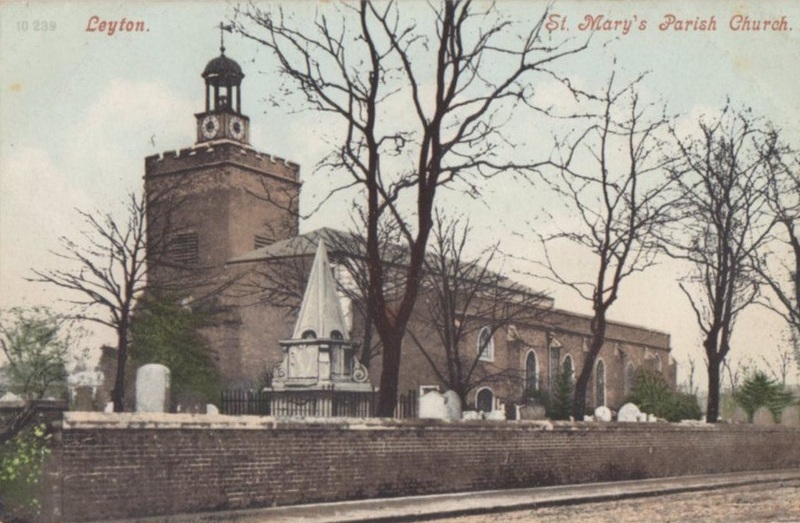 He died in 1809 having never married but having fathered, according to his will “Captain Johnson my reputed son” who in turn had “by the child of a convict of Botany Bay, the mother already mistress to another man, two children. To my executors £2,000 to be laid out in the Equitable Insurance Office for paying to each of those children at age 21 the sum that they think equivalent for £1,000.a child.” Sir John remained on friendly terms with Richard the rake until his death in Falmouth and through him came to know the rest of the family. He carried out various commissions for Samuel, including work at Forest House, and after his death seemed, as Dean outs it, 'genuinely moved to produce something worthy' of his friend whose portrait still hangs in the breakfast room at Lincoln's Inn Fields.